In Arizona, we have just enough cold weather in December and January to claim we actually have a “winter season.” So, to honor the (three) days of sub-70 temps, here is the “Winter” edition of Top Taps, places you need to visit NOW! The Whining Pig has made a name for itself in the Valley beer scene by offering a rotating menu of eclectic brews and quirky atmosphere. 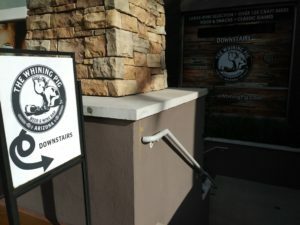 While each of their six locations offers unique charms, the Desert Ridge location may be their best yet. Whining Pig—Desert Ridge sports the same basic floor plan as the downtown location and the same chalkboard menus and hip vibe as any of their taprooms, But the underground venue of Desert Ridge affords them a bit more space to spread out, complete with outdoor picnic tables and artificial grass. Additionally, the “hidden in plain sight” speakeasy vibe of the underground space has been a rousing success and afforded Whining Pig to expand the Desert Ridge location after only a few months of operation by adding…get ready for it…a speakeasy. The soon-to-open hidden drinking place will be next door to the taproom, but only accessible via the back hallway after you descend the secret stairs and…oh heck…you’ll find it. It’s there. Tentatively set to be called “Pig Tails”, it will offer a raw bar, in addition to a few extra non-beer options. The guys at Desert Ridge tell me that Friday and Saturday nights are nearly standing room only already in the taproom, and the addition to “Pig Tails” stands to take the Whining Pig experience up a notch even further. Winter is the season for dark beers. The colder it gets, the more we want something black and roasty. No valley brewery has a better menu of dark beers than Bone Haus, the newly opened brewery in Fountain Hills. On a recent visit, of 14 house beers available, more than half were browns, porters, stouts or dark ales. Of note is their “Red Velvet Stout,” which patrons were raving about, and “Miner’s Debt,” a black IPA that Phoenix Magazine listed as their #1 beer of the summer. Bone Haus is also one of the best themed taprooms in the valley, with caskets, skeletons, wrought iron fencing and femur bone tap handles making up the décor. Make a point to visit after sunset, when the Edison light bulbs cast an eerie glow across the bar.